Remember a few short years ago when the hot debate was whether cars in the future would be predominantly powered by fuel cells versus batteries? And even more fundamentally, if electric vehicles would ever move beyond the niche “green” and luxury-performance buying market? For this and future posts I will use the specific 16% target of new EV sales as a percent of total auto sales. The 16% milestone combines “Innovators” (2.5%) and “Early Adopters” (13.5%) from the widely accepted Everett Rogers diffusion of innovations technology adoption curve and would mean EVs have reached the “Early Majority” and achieved clear adoption by American consumers. While auto industry experts don’t agree on the future forecast of new auto sales, using 17 million per year as a reasonable estimate going forward, US consumers would need to purchase roughly 2.7 million BEVs and PHEVs to reach the 16 percent level. This equates to a level of sales 18 times greater than the roughly 150,000 EVs sold in 2016. Wow. We have a long way to go. But just how long? When will 1 in 6 new autos purchased in America be fueled partially or entirely by a plug-in battery? To try and get our arms around this question of “When?,” I’ve created an EV adoption framework and acronym that I’m calling “CARMA.” While some variables will prove to be more crucial than others, EV adoption is going to require at least five key factors to come together to reach the magic level of mass adoption. C = Charging Speed and Availability: As of January 2, 2017 there are 15,098 EV charging stations and 32,290 outlets in the US, according to the Alternative Data Fuels Center. 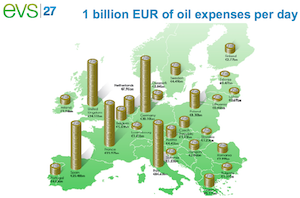 By contrast, there are 8 times more gas stations, at more than 121,446. And while this “refueling station” gap is closing rapidly, it ignores a few key differences between gas and electricity “refueling” needs. One of the key selling points of EVs is the ability to charge your car inexpensively at home, including during the middle of the night when electricity rates are lower. When parked in your garage, the time to recharge your car is of little consideration as long as it is fully charged in the morning. But millions of Americans will likely want to install specialized EV chargers in their garages to enable more convenient and quicker charging than plugging into the nearest 110V or 220V outlet with an extension cord. According to analysis by the Rocky Mountain Institute, the average total cost for a home Level 2 charging setup (equipment plus electrician costs) is around $1,200. With 70 million single-family detached homes in the US, home charger installation will be a significant opportunity for electricians and EV charger equipment suppliers, but a cost hurdle for many households. Charging an EV when traveling on road trips of several hundred miles is of course more akin to filling up at a gas station — except for the time factor. Putting 15–20 gallons of fuel in your car’s gas tank takes about 5 minutes, whereas even a Tesla Supercharger takes about 20 minutes to add just 50% of battery range to your Tesla EV. Tesla has nearly 350 Supercharger stations across the US, with many of them along major interstate corridors between major cities. And according to the Alternative Data Fuels Center, there are 5,192 DC Quick Charging stations. This is a good start, but thousands more quick chargers are needed across the US to help reduce range anxiety, especially for longer trips. Multi-family complexes — Apartments, condos, and townhouses comprise 37% of American households, but currently tend to lack convenient charging. Enabling renters to conveniently charge “at home” is vital to EV adoption. Interstate and destination locations — Enabling convenient and quick charging for EVs with a practical range of at least 150–200 miles (241–322 kilometers) removes a key concern and negatives of EVs not being viable for long trips. Quick charging — Charging overnight at home is a non issue for most, but when traveling on short or long trips, “time to charge” becomes vital. Early adopters, such as Tesla Supercharger users are willing to wait 30 minutes on their family trips to add 200 miles (322 kilometers) of range. But the later adopting family that “just wants to get there” won’t be as willing to sacrifice their time until quick-charging capabilities reduce charging time down to about 10 minutes for 150–200 miles (241–322 kilometers) of additional range. The growth of chargers at workplaces and retail locations will play a role in reducing range concerns, especially for renters lacking convenient charging access at “home.” But as “home charging” becomes the norm with longer-range EVs, quick charging and destination chargers will be the most critical enablers of mass adoption of EVs. A = Affordability: EVs and PHEVs are currently too expensive, with many pure battery electric or plug-in hybrids costing $10,000–$20,000 more than their non-plug-in sister or comparable models from the same manufacturer. There are a few exceptions, including the Nissan LEAF and Fiat 500e in states with significant incentives and the Tesla Model S and X, which are similarly priced to other high-end luxury-performance models. The key factor driving affordability in the next 5 years will be the cost of batteries, which are estimated to be the single largest cost in the manufacturing of EVs. Several experts predict that battery prices will decline 50% or more by 2022, which will put many EV models at cost parity to their comparable internal combustion engine (ICE) models. As demand for EVs rises, overall production costs will also decline from increased scale in the manufacturing process. This suggests, however, that demand for BEVs and PHEVs could grow significantly with a combination of high gas prices (e.g., above $4 per gallon) and auto manufacturers offering the American consumer high-utility vehicles (SUVs of all sizes, crossovers, mid-/full-sized cars, and pickup trucks). R = Range: Out of approximately a dozen pure BEVs on the market in the US, only 3 have a range of more than 200 miles (322 kilometers) — the Tesla Model S and X (208–315 miles/322–483 kilometers) and the just launched (but only in select markets) Chevy Bolt (238 miles/383 kilometers). The Tesla Models S and X, however, are only within reach of perhaps 5–10% of American households, and the Chevy Bolt is a small city car that is only attractive to another minor segment of the US population. Most pure BEVs, such as the Nissan Leaf, Fiat 500e, and Ford Focus Electric, currently average +/- 100 miles (161 kilometers) of range. On the positive side, range-extended PHEVs, such as the Chevy Volt, can often travel more than 400 miles (644 kilometers), though having electric-only ranges of about 25–50 miles (40–80 kilometers). This lack of acceptable range is the biggest shortfall of current EVs today. A National Renewable Energy Laboratory (NREL) survey of consumers conducted in February 2015 revealed that 56% of Americans won’t consider buying an EV unless it has at least 300 miles (483 kilometers) of range. In the next 5 years, many EVs will likely be able to charge to a range of 150–200 miles (241–322 kilometers) in about 10–15 minutes, potentially reducing the “acceptable” total range to 200–250 miles (322–402 kilometers) for many consumers. With battery efficiency increasing and costs expected to decline by 50% or more in the next 5 years, the average range of a non-luxury/performance EV is likely to reach 200+ miles (322+ kilometers), with many at or above 250 miles (402 kilometers). And the average range of higher-end luxury or performance cars will likely be 350–400 miles (563–644 kilometers). With typical battery ranges of 200–300 miles (322–483 kilometers), charging times of 10–15 minutes for 150–200 miles (241–322 kilometers) of range, EVs will become significantly more attractive to the typical American car buyer by 2022. M = Model Availability: As of January 2017, there are 30 PHEV and BEVs on the market in the United States out of more than 300 car models. That is a small fraction of available car models, but more significantly, EV availability varies from zero or only a few models in several states to all models in the compliance-car state of California. But perhaps most significantly, there are still popular auto categories that have either zero or a just a few available models of BEVs or PHEVs, such as pickup trucks, small and large SUVs, minivans, and crossovers. Through November of 2016, these “light-duty trucks” categories comprised 59% of US auto sales. Mid-sized and large cars comprised another 18.5% of sales to date in 2016, yet only a few plug-in cars are available, such as the Ford Fusion Energi. Until BEVs and PHEVs are available, at least in the United States, in the types of car and light truck models that are popular and in high demand (77.5% of sales currently), EVs will not gain mass adoption. 1) It will be interesting to see if the push toward autonomous cars by ridesharing/on-demand taxis, technology, and major auto companies has any impact on the supply of electric cars. 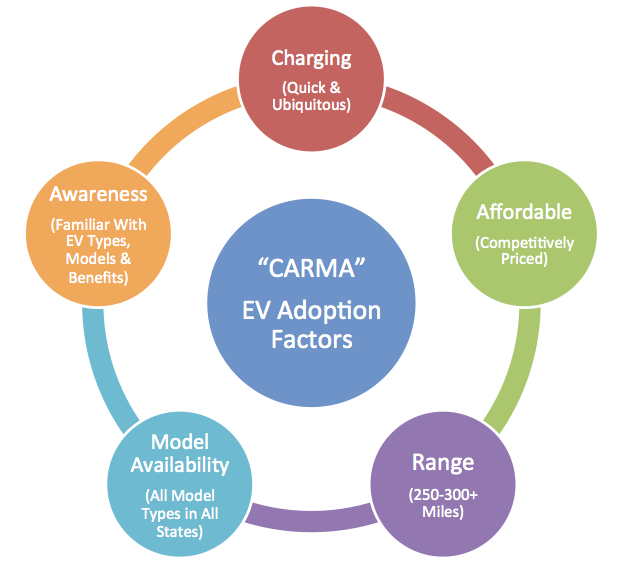 A = Awareness: Along with model availability comes actual awareness and understanding of EVs and PHEVs. While in some Northern California communities, for example, there is literally a Tesla on every block, in many parts of the US, consumers have never seen a Tesla and couldn’t tell you want the acronym “EV” stands for. 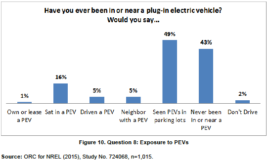 According to the previously mentioned NREL survey, 43% of respondents said they’ve never been in or near a plug-in electric vehicle and 52% could not name a single model. In a more recent survey from Altman Vilandrie & Company, 60% of American drivers said they were unaware of electric cars and 80% have never ridden in or driven one. Beyond this lack of awareness and familiarity of electric vehicles, many Americans simply don’t have an understanding of the differences — advantages and disadvantages — between hybrids, plug-in hybrids (PHEVs), and pure battery EVs (BEVs). To move beyond EV enthusiasts and early adopters, the auto industry must do a better job of educating the average consumer on the various types of available electric cars and the corresponding models. Education and awareness are clearly key to EV adoption, and a renewed effort by industry participants could potentially double the number of EV sales in the US. But the lack of availability of affordable, long-range, quick-charging SUVs, crossovers, pickup trucks, and mid/large family sedans is what is actually keeping EV sales to less than 1% in the US. So, when will the US “cross the chasm” into the “Early Majority” with EVs accounting for 16% of new car sales? I’ll conduct a detailed analysis in a future post, but a back-of-the-napkin forecast suggests that we’ll reach this milestone in about 2024. 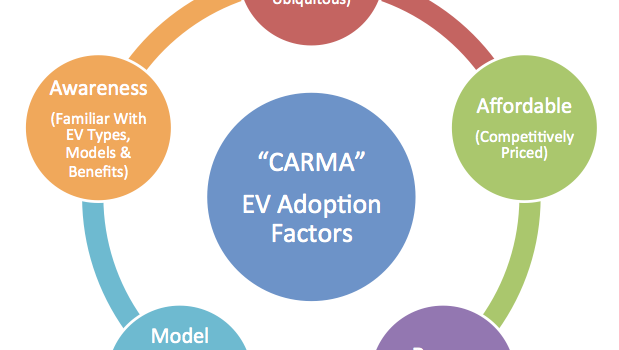 In future posts, I’ll delve deeper into the above factors in an attempt to try to estimate the timing of EVs “crossing the chasm” into mass adoption and provide some prescriptions that could speed up adoption. I’ll be leveraging both primary and secondary research as well as behavioral economics concepts, and I’ll always attempt to apply rigorous analysis of existing data.